Trash To Couture: DIY out-dated tshirt into lovely pencil skirt. DIY out-dated tshirt into lovely pencil skirt. The perfect lace pencil skirt all from a thrifted shirt and oh so comfortable. -thrifted shirt: needs stretch. Think textures like lace, crochet, bold t-shirt prints. Before: this tshirt was outdated and needed a revamp. I loved the pattern of the lace and decided it would be a great pencil skirt. Cut the sleeves and collar line. Sew a tube that fits your waist and hip measurements snuggly. Trim the excess from the seams. 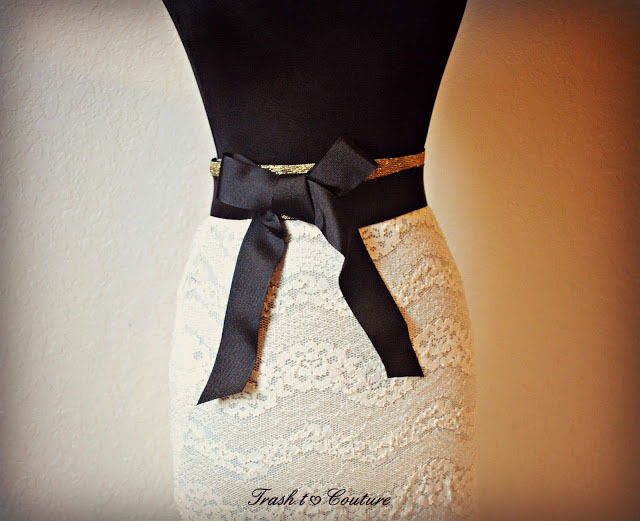 Sew the elastic waistband to match your waistline on the skirt. Top stitch along the edge. Trim an excess fabric. OMG what a cute and great idea!!! New to your blog, but now subscribed. I wish I had your amazing sewing skills! thanks everyone. Lots of trial and error when it comes to learning sewing but so worth it! This is a very cute skirt! Thanks Geneva. LOVE ur DIYs!! Very inspiring. This looks beautiful. I must try it. I love the lace look. I'm going o snag one of these, the next time I it the thrift sore. Pencil skirts look fab on you, I remember the last skirt you made out of a shirt, it was awesome too. This one is different but also so cool, I love the waist you made with that bow. This is gorgeous. You are a fashion genius! Because of your blog, I am going to buy a new sewing machine. I have missed sewing and you have made me want to do it again! Beautiful! Thanks for the instructions! i love your blog, your ideas so cute! So pretty! I love this one! So glad I came across your blog. You are truly talented! Congrats!! What a great job!! Looks so smart!!! Hey, I love this look and have had it bookmarked to try for a loooong time! Was wondering where you found that cute waistband? perhaps scavenged from an old skirt? Gosh!!! This is amazing!!! It is so lovely! Just gorgeous and so easy!! Gorgeous! I can't wait to make one. Ah!! I need to go find a lacy top at my local thrift store!! This is a fab idea. I have some tops where I like the pattern but not the style I will definitely see if they will fit my hips lol. You have a great artist in yourself. You have made a really awesome looking t-shirt. Thank you for sharing a very valuable information to us. I will definitely to create for me as i'm not much creative I know it will not look as cool as you had created. I'll sure update this kind of stuff in my collection soon so you can even earn money for your creativity. Check this website www.gkfashionstore.com for collection of dresses, footwear and handbags products for womens. Need more detailed instructions on how to attach the waistband. How is it secured before being topstitched? Need more detail about how to attach the waistband. How is it secured before being topstitched, and where exactly should it be topstitched? Top and bottom? Is the waistband attached like other elastic waistbands? Need better instruction for beginners. 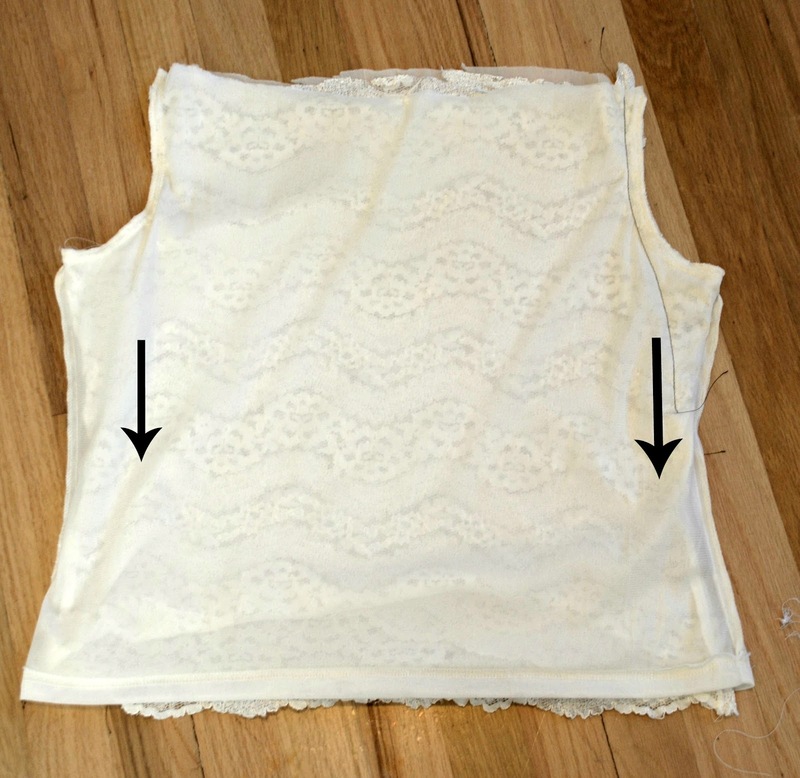 I have a stretchy ivory lace shirt much like this. Perfect project for an upcycle. So great idea! I have the perfect old t-shirt for this project. It's one of my favorites,but it will definitely look better recycled that way. Thanks for sharing! interesting articles and this is my first first reading a very interesting article thanks for this article that fits with the theme news. This is the information I am looking for. I can't believe how cute this is! Great job! This is so creative! I think I'll fold my elastic under and sew down on the sides so it's invisible.